It’s time for the third installation in our summer blog series about the newest members of the zoo family. Featuring our ring-tail lemur, Saboo, we’re sharing more each month about her life at the zoo, interesting lemur facts, all about Madagascar and much more! This chapter is all about how lemurs like Saboo communicate, and their social groups. Just like humans, Saboo and her relatives are social animals. Ring-tailed lemurs live in groups called troops. Females stay with the troop they’re born into, while males join other troops as adults. Shout it from the treetops! Saboo and her lemur friends are great communicators. They use their tails to communicate without words, the same way we use facial expressions and body language. 3, 2, 1: STINK FIGHT! They also use scent to communicate. 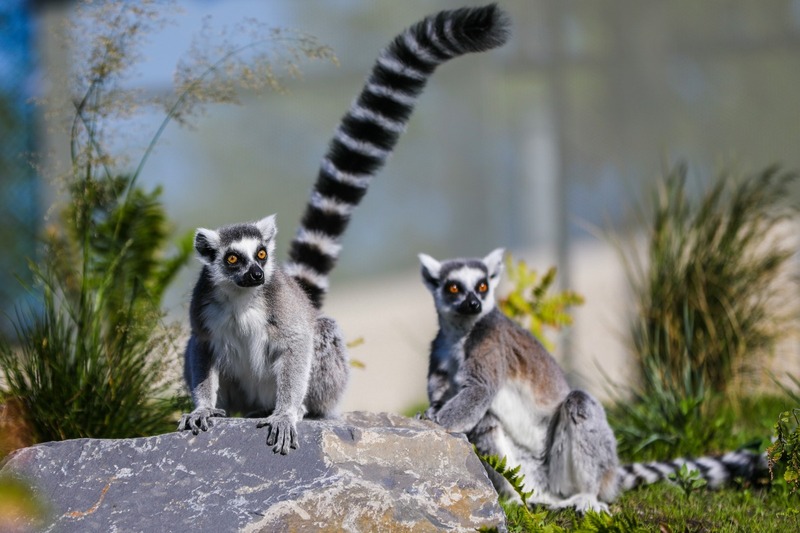 Male ring-tailed lemurs use scent glands on their wrists and chests to wipe scent on to the tips of their long tails, which they then wave at other males to waft the scent in their direction. These “stink fights” can last just a few minutes, or up to an hour. Lucky for our visitors, Saboo is part of an all-female troop. No stink-fights in the Land of Lemurs! Saboo, like the rest of her troop, likes to sunbathe to warm her body in the cool morning. During the hottest part of the day, Saboo finds a cool spot for a nap. In the wild, lemurs forage for food after their morning sunbathe and again in the evening, before going to sleep in the trees. Lemurs grow up fast. 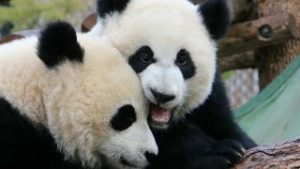 By the time they’re two or three years old, females are already mothers! Saboo is 11, and as part of an all-female troop has never been a mom. But Radish and Red Baron, our red-fronted lemurs, have two offspring: Rhubarb and Dora. Lemurs mate for just a few days each year, and in the wild, they can have multiple mates. Some lemur species are a pair bonded for a long time – or life. Female lemurs are fertile for just one day a year. Lemur pregnancies can be short — just 135-145 days. The mating season is short as well, and always at the same time each year, so all the females are pregnant at the same time. 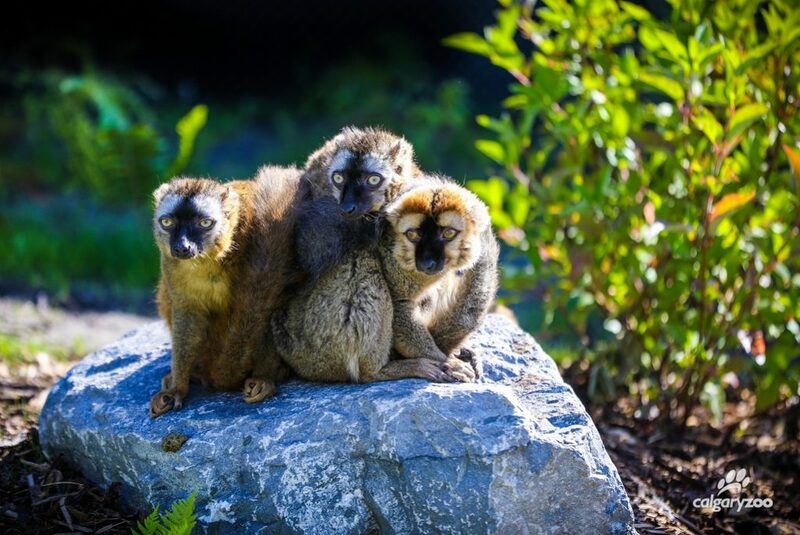 Watch for our red-fronted lemur family when you visit the Land of Lemurs! Saboo lives in a safe environment in the zoo, so she’ll have a much longer life expectancy. If she lived in the wild, where survival takes some serious work, her life expectancy would only be up to 18 years of age. Short lifespans, slow reproduction rates, and disappearing habitat all contribute to their low population. Some lemurs are critically endangered and some are considered vulnerable by the International Union for the Conservation of Nature (IUCN), which publishes a “Red List” of species in danger. Not all lemur species have female-led groups. Red-fronted lemurs live in troops led by a dominant male. Rhubarb and Radish’s little “family,” which includes little sister Dora, is led by Red Baron, a 25-year-old male.